I am back from vacation! We survived and had a wonderful time! It’s really been hard getting back into the groove, and it didin’t help that school started Monday! There is a new watch out there called the G4 by Just Bling Watches. JBW is an attainable diamond watch brand that defines urban luxury for young-minded people seeking to achieve greatness and take on the world. 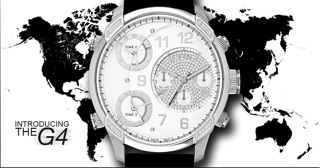 The American brand was founded in 2006 with the desire to fuse modern design aesthetics with premium watch making. Their watches are amazing!! This isn’t a giveaway just yet…first you have to go to JBW Facebook Page and like them. Then post on their wall that TwinkieMommie sent you. If enough people are sent through my page I will get to give away one of their beautiful watches! !